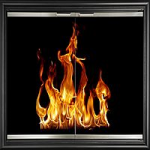 Lightweight and durable, the Portland Willamette Aluminum Extruded Fireplace Door Series is highly functional yet very affordable. An excellent choice for exterior applications. The Breckenridge Glass Door is an elegant addition to any decor. Enjoy this majestic beauty in your home. 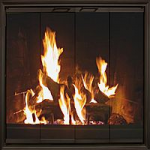 The thick frame showcases our brilliant finishes making your fireplace the star of your space. 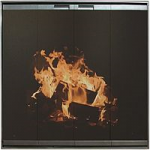 This door is available in all 14 of our Standard Finishes. Can be used for Masonry or Zero Clearance applications. This door is also available as an option for corner installation. Available in 14 of our Standard Finishes. The Creekside door can be used for Masonry and Zero Clearance applications. 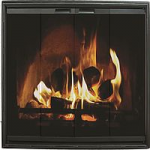 With its low profile simple frame the options are endless to accent any room. Available in 14 of our Standard Finishes. The Manchester door can be used both for Masonry and Zero Clearance applications. This door is built with precision to exact specifications. Extruded aluminum construction. Innovative design is sleek and provides ample cooling air without large gaps. Available in all 14 of our Standard Finishes. 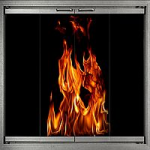 The Gallery door is available for use with masonry application only. 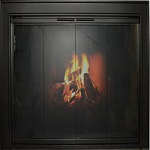 A standard sized door it highlights the best features of a traditional fireplace door. Available in 14 of our Standard Finishes. 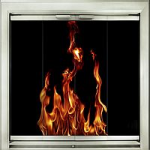 The Envision door is meant for use in masonry applications only. This door is light weight, durable, and highly functional. A very affordable door option. Also, an excellent choice for exterior application due to the aluminum construction. Available in 14 of our Standard Finishes. The Crown is a beautiful Masonry Only door. 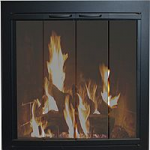 Available with a two-tone finish this unique aluminum door also has a rope inlay option to really give your fireplace door a unique feel. This door option may also be used in a corner application. Available in all 14 of our Standard Finishes.